RALEIGH, N.C. — See a hellbender? If so, biologists with the N.C. Wildlife Resources want to know when and where so they can continue their long-term inventory and monitoring of this giant, aquatic salamander. 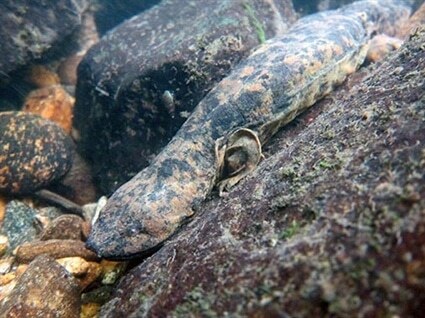 Anyone who finds a hellbender is asked to leave it alone but to note the location (physical location or GPS coordinates) and take a photo, if possible, and email that information to Williams at [email protected]. If anglers happen to catch one on hook and line, they should carefully remove the hook if it is safe to do so without harming the animal or cut the line as close as possible and return it back to the water. People also can call the Commission Wildlife Interaction Helpline (866) 318-2401 and provide details of the observation.